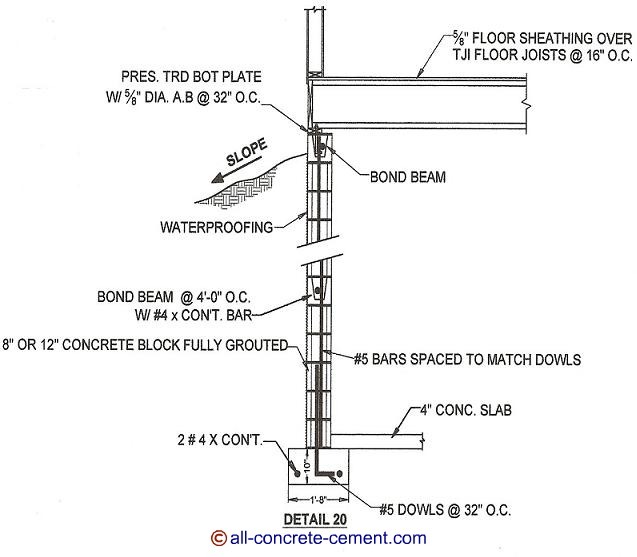 Concrete block foundation and cinderblock foundation are both used for home foundations as indicated in foundation details such as detail 20 below. As shown, these are very similar to cip (cast in place) concrete foundation walls. In fact the footings size and reinforcements are exactly the same for cip concrete foundation walls and CMU foundations. The biggest difference is the dowls that provide vertical reinforcements for the block wall which can be as close as 8 inches on center (every cell), 16 inches on center (every other cell), 32 inches on center or max at 48 inches on center. Cip concrete wall are reinforced vertically at 16 or 24 inches on center and very rare 12 inches on center. The horizontal reinforcements for block walls are usually spaced at 4 feet on center intended to be the same location as the bond beams. Per code as well as engineering recommendations, block walls are to be installed in 4 feet lifts. This recommendation will ensure that the grouting is properly consolidated.Horizontal reinforcements for cip concrete wall in most cases match the vertical reinforcements but not more than 24 inches on center. Due to difficulty of lifting each block over the vertical reinforcements for installation, the vertical bars are cut in 4 to 6 feet sticks to accomplish both the splice length and easy of labor. These vertical reinforcements are intended to be at the middle of the walls and they should be grouted solid. One of the requirements for block walls used for foundation wall purposes is they need to be fully grouted. A solid grouted block foundation wall will provide the needed strength necessary to support the structure they intend to carry. This applies to both basement foundations as well as 2 to 4 feet foundations. Block foundation walls not only hold the structure upright, they prevent the structure from falling over due to wind and/or earthquake. They also prevent earth pressure from weakening the structure they intend to support. Like cip concrete foundations, cmu block foundation walls also require waterproofing as well. These waterproofing not only prevent water leakage to basements, it also prevent the foundation corrosion due to water.